The followings chapters & chapter leaders are: 1) Brisbane Chapter (Iraphne Childs) 2) Northern California Chapter (Barbara Bornet Stumph) 3) Southern California Chapter (Claire Langham Richmond) 4) Chennai Chapter (Secretary S. Rajamani) 5) Hawaii Chapter (Carl Hefner) 6) Kansai Chapter (Seiko Furuhashi) 7) Karachi Chapter (Kamal Siddiqi) 8) Korea Chapter (Jung Talk Lee) 9) Lahore Chapter (Arfa Zehra) 10) Lao Chapter (Chantavong Saignasith) 11) Mumbai India (Sarosh Bana) 12) Myanmar Chapter (Soe Win/Soe Naing) 13) Nepal Chapter (Nirendra Maske) 14) New York Chapter (Bill Armbruster) 15) Okinawa Chapter (Keiko Yamazato) 16) Philippine Chapter (Pauline Bautista) 17) PNG Chapter (Solomon Kantha) 18) Singapore Chapter (Alice Seng Seok Hoon) 19) Taiwan Chapter (Nora Chiang) 20) Tokyo Chapter (Yasukata Yano) 21) Washington D.C. Chapter (Jacob Dowd). Chapter leader Iraphne Childs is out of the country for an extended period (December 2013-January 2014). As such the group has nothing to report at this quarter. Chapter leader Barbara Bornet Stumph reported three significant events coming out of the chapter. First, with the support of Dr. Morrison, Dr. Pickering and Dr. Bullock, Director and Asst. 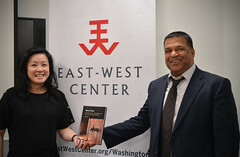 Director of the Asia Society, the chapter co-sponsored a lecture on Monique Demery’s published book: Finding The Dragon Lady, The Mystery of Madame Nhu.The event was aired on National TV by CSPAN. The EWC was mentioned in the introduction and the chapter leader handed out EWCA brochures. 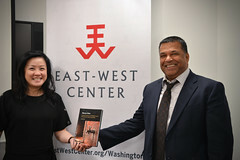 Second, co-sponsored by the Asia Society, the chapter held a lectureship on: The Empress Dowager CuXi, The Concubine Who Launched Modern China, an enthralling book by the author Jung Chang. Among the author’s contention, CuXi was given a bad press by male Chinese historians who preferred to downplay the accomplishments of a strong female Empress. Third, following emails and an hour-long interview, Barbara nominated Ruby McDougall for an EWC Fellowship. Formerly from New York, Ruby has lived in China, studied Mandarin and teaches empowerment to young women by teaching them dance. She introduced Ruby to EWC alumnus Garrett Lam of Bali. Thanks Barbara for your continuing support of the EWC fellowship programs. While the Southern CA chapter did not have formal chapter events to report for this quarter, Chapter President Claire Langham Richmond did note that their next chapter gathering would be in February or March 2014. The chapter forwarded very happy get-together photos of their EWC chapter activity meetings in 2008, 2012 and 2013. The photos reflect fun and enjoyable times among the members. Chapter Secretary S. Rajamani reported that the Chennai chapter held their meeting on October 28, 2013. Aside from the Secretary, Vasanthi Ranganathan, H.K. Laksman Rao, K.B. Sankaran and Syed Ali Mujtaba were in attendance. Leave of absence was extended to the following members: President P.M. Belliappa, VP P. Subramaniam, Roopa Nagarajan, Ms. Shreya, and Mr. Sivasakthi Raj. At the meeting, the chapter Secretary held a briefing on the chapter activities starting with the participation of Vasanthi Ranganathan, S. Rajamani, Pres. P.M.Belliappa and VP P. Subramaniam at the EWC 50th Anniversary celebration in Honolulu. Likewise, participation by chapter members at the Beijing conference in 2012 such as the presentation of R. Sivasakthi Raj on the topic of climate change was noted and appreciation extended to new younger members involved in the EWC Asia Pacific Leadership programs. The chapter plans to organize joint activities with the Rotary Club, Health and voluntary organizations to produce the following action goals: 1) organize health camps in Ambattur Rotary Club Hospital 2) provide books, pencils, notebooks, etc to the Academic Support Center in Ayapakam 3) provide construction labor to support the school for children 4) organize a health camp at Chembarambakkam in the village. To enhance their activities, the members will address clubs, invite Fulbrighters to visit suitable locations, get an updated list of EWCA members in the Chennai region from the Alumni Office. Member Syed Ali Mujtaba has created a Google group of India-Pakistan Friendship organization promoted by Mumbai Chapter President Sarosh Bana. Chapter leader Carl Hefner announced the Annual Dinner & Fundraiser of the Hawaii chapter for April 13, 2014 at Honolulu’s Pacific Club. The event is a combination of their annual meeting, an art bazaar, traditional Asian art auction and EWC grantees dance performances. Funds raised will support student scholars by enhancing their professional career development via attendance and paper presentations at prestigious professional conferences. Reviewing the chapter activities for the 2013 Fall quarter, the Hawaii chapter continues to be active. The successful annual Community Building Institute picnic on August 17th, attended by over 200 EWC staff, alumni and incoming EWC participants provided opportunities for networking and socializing among attendees and for the sharing of Hawaiian culture learning lecture by alumnus Alapaki Luke. Two chapter-sponsored events were held on December 2013: 1) With Itsuko Suzuki as the lead, members of the Hawaii Board staffed a table of handicrafts/jewelry at the EWC Christmas Fair. Funds went towards student scholarships. 2) The Hawaii Chapter Board held their December meeting at Kapiolani Community College’ Ka Ikena Room where they dined on a fine buffet prepared by award-winning KCC culinary students. Chapter leader Seiko Furuhashi reported with deep sadness the death of recently selected Deputy Chapter leader Kiyoshi Hamano who passed on unexpectedly on December 23, 2013. The chapter shared a picture of a friendly and healthy looking Kiyoshi speaking at the chapter’s General Meeting held on August 3, 2013. Our deep condolence to Kiyoshi Hamano’s family and to all the Kansai chapter members for the sudden loss of a member described as a good and dedicated human being. The General Meeting of the chapter, held in Kyoto at Doshisha University on August 3, 2013, had eighteen attendees including guests as Keiko Yamazato, Okinawa chapter and Eriko Yamamoto, Chuba chapter. The following meeting activities occured: 1) Guest Speaker Yasumasa Maeda, Hiroshima Prefectural Government talked about cross cultural training for International Liaison Officers. 2) Progress reports on the Beijing Conference was presented by Seiko Furuhashi while Prof. Yamazato reported on the upcoming 2014 International Conference. 3) Election and re-election of officers were held: Seiko was re-elected chapter leader, Kiyoshi Hamano as Deputy chapter leader, Board members: Nobukazu Tanii, Fumiteru Nitta, Yumiko Okamoto, Jideaki Sakamoto, Marie Thorstein, Yasumasa Maeda, Kazufumi Boh and Advisers, Eiji Saito and Tomohide Ashida. 4) The chapter will start collecting a membership fee of 1,000 yen per year, which will be announced in the chapter newsletter. 5) For better communication/information exchange, the chapter will set up a Kansai chapter “group page” with members’ privacy as a caveat. Chapter leader Kamal Siddiqi reported that on September 2013, the Executive Committee of the Karachi chapter held a meeting. It was noted that two leadership members have left the country – the Vice-President and Treasurer of the chapter. The following goals were defined at the meeting: 1) Efforts to enroll old members and new members (EWC returnees in 2012 & 2013) will be renewed. 2) A letter was sent by the chapter President to the US Consulate General in Karachi offering chapter services to identify candidates for the US Pakistan Journalism Program. 3) With the cooperation of alumnus Aziz Husain, starting 2014, a socially responsible chapter program for computer training for children from less affluent backgrounds will be set up. 4) Finally, chapter members are making plans for the visit of US journalists to Karachi under the US Pakistan Journalism Exchange program happening in the 2nd quarter of 2014. Chapter leader Jeong Taik Lee reported that on January 13, 2014, leading members of the chapter will hold a luncheon meeting. The purpose: to prepare for the 2014 Annual Chapter Meeting on January 24, 2014. The latter meeting will be held together with the UH Korea Alumni meeting in Seoul. We are especially thankful for the encouragement that our Korea chapter leadership is taking on 2 worthwhile activity proposal of the EWCA Endowment committee. The chapter will encourage members to participate in two scholarship fundraising activities: 1) the EWCA Virtual Wall of Honor project and 2) the proposed $50,000 Permanent Endowment in the name of Alumni Officer Gordon Ring. Mahalo for the positive response to this call. Chapter leader Jeong Taik Lee will attend the 2014 Conference, will encourage other members to attend and the chapter will publicize the 2014 Conference in Okinawa. The chapter leader reported that the chapter hopes to take a flagship initiative where alumni members enjoy philanthropy driven entrepreneurship activities in their senior years. Congratulations to Lahore Chapter leader Arfa Zehra, who was awarded a Lifetime Achievement Award in September 2013. Chapter members were invited to dinner and a musical evening to celebrate the event. Additionally, Arfa was the Keynote Speaker at the Teacher’s National Conference on December, 2013 where the Lahore chapter’s involvement in educational and social activities was recognized and appreciated. At the Center of Bioethics and Culture in Karachi where educational exchange programs were discussed, the Chapter leader familiarized participants with the EWC programs which created serious interests among career participants. The Lahore chapter’s outreach projects that help school children from marginalized families is ongoing. The chapter continues to provide clean drinking water to students from low budget schools and the chapter likewise provides schoolbooks from funds generated by the chapter on a donation basis. Laos Chapter leader Chantavong Saignasith is sending holiday greetings to everyone and is on a holiday in Australia so the chapter does not have anything to report for this quarter. Chapter leader Sarosh Bana reported on the result of their chapter’s quarterly meeting held on December 3, 2013. The meeting had a festive holiday atmosphere and participation at the forthcoming 2014 EWCA Okinawa Conference was discussed. Attending the meeting were retired chapter members D.K Sankaran and his wife, Joyce. D.K Sankaran was the state government’s former Chief Secretary and Joyce was the state government’s former Education Secretary. Both will be in Hawaii around FebruaryMarch and will be staying at the EWC Lincoln Hall. D.K wanted to visit EWC offices and inquired about the possibility of doing an informal talk on the topic of South Asia’s Geo-Political situation, his area of expertise. Chapter leader Soe Win reported that effective January 1, 2014, she has transferred the Vice-President (1) and Communication Officers’ responsibilities to Soe Naing, Vice-President (2). It is hoped that the latter can give energetic support to the EWC chapter alumni in Myanmar as well as to the Media Conference in March, 2014. Chapter leader Nirendra Maske reported that the chapter was busily involved with the Historical Constituent Assembly election held on Novermber 19, 2013. In what was seen as a credible, fair and peaceful election, the democratic forces of the Nepali Congress overwhelmingly won over the majority holding Moist Party. Observer of the election included the United Nations and the Jimmy Carter Center (headed by former President Jimmy Carter) who submitted their observer report on the election. Due to the holidays and the election, the Nepal chapter did not have further activities to report for the period November 2013 to January 2014. Chapter leader Bill Armbruster reported that chapter activities for the next quarter is on his “to do” list. No events were scheduled for this quarter. Congratulations to Okinawa senior chapter member Hiromitsu Miyagi who received a Distinguished Service Award from the Okinawa Prefectural Government. Hiromitsu was a former Vice-Governor of Okinawa Prefecture, contributed to the economic development of Okinawa and the improvement of the Okinawans’ living conditions. We thank Okinawa Chapter leader Keiko Yamazato for her positive and generous comments about the chapter reports and for introducing the $50,000 Permanent Endowment for Alumni Officer Gordon Ring to the chapter members at their general meeting on February 1, 2014. Mahalo Keiko. For this quarter, the following are the activities of the members: 1) The 2014 International conference is fast approaching and all chapter members are asked to cooperate in the preparation. 2) The chapter is inviting more than 350 alumni and their family members to the conference. 3) The Executive members hold a weekly meeting every Monday night to discuss how to best serve the overseas participants and have been busy visiting the local government, leading companies and others to solicit their financial support for the Conference. 4) Members have visited hotels several times to check halls, rooms and equipment needed for the Conference. 5) Beyond chapter members, Professors of Okinawa Prefectural University of Arts are supporting the Conference by sending their students to perform Okinawa dances at the event and introduced sites to be included in the post Conference tours. Chapter leader Solomon Kantha reported that the chapter did not have any major activity to report for this quarter. Based on the report submitted by Chapter lead Pauline Bautista, congratulations are in order to the Philippine Chapter. First, congratulations to EWC alumnus Alex Brillantes, Philippine chapter Board member and former President of the EWCA Philippine Chapter for his recent appointment as Commissioner of the Philippine Commission on Higher Education. Second, congratulations to the EWCAA-Philppines chapter for receiving a Travel & Accommodations Grant from the US State Department, Education and Culture. The grant will reconnect EWC alumni events in 3 major areas in Luzon, Visayas and Mindanao. The Siningbayan-Palay, Bigas, Kanin project has several EWC alumni serving as Writers & Resource Persons. Third, convened by the Pimentel Institute for Local Governance (headed by Philippine Senators Nene and Koko Pimentel), the Philippine Association for Public Administration (headed by Alex Brillantes) and the Mindanao State University (headed by Mac Muslim) – chapter members Alex Brillantes, Pauline Bautista, Mac Muslim, Gwenn Pimentel, Koko Pimentel and Nash Sampaco formed the first Muslim-Lumad-Christian Youth Leaders Peace camp titled: “Batang Transformers” –i.e. Youth Transformers. Fourth, former EWC alumnus who hold government posts are: Philippine Senator Koko Pimentel; Philippine Peace Panel Head, Senen Bacani; Director General of the National Economic Development Authority, Secretary Arsi Balisacan; Adviser for Political Affairs, Undersecretary Chito Gascon; and the Commission on Filipinos Overseas, Undersecretary Gertie Tirona. Fifth, EWC alumnus heading up academic institutions are; President Mac Muslim, Mindanao State University; President Jose Abueva, Founder of Kalayaan College; Dean Ramon Clarete, University of the Philippines School of Economics and Dean Jose Buenconsejo, University of the Philippines, College of Music. Thank you Philippines chapter for the beautiful group pictures which included Hawaii’s Ric Trimillos. On a sad note, our deep condolence to the family of Cres Gonzaga and to the Philippine chapter and members. Cres Gonzaga was an esteemed Philippine chapter Director for the Visayas and a well-respected President of Leyte Normal University. She passed away on January 14, 2013. 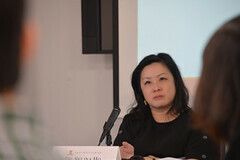 Chapter leader Alice Seng Seok Hoon reported on two activities of the Singapore chapter. 1) On October 9, 2013, as a result of the 2012 SEAYLP (Southeast Asia Young Leadership Program) organized by the EWC, the chapter had a meeting with Has Gunawan who was the leader of a group of five Singapore student youths who attended SEAYLP. Has is currently the Head of the Science Department of Whitley Secondary School and the Singapore chapter explored ways to connect chapter members with the student participants of SEAYLP. Result: Has will share his SEAYLP experiences with the chapter in 2014 and a share and tell sessions with other secondary school environmental clubs are planned. 2) On December 17, 2013 the chapter held their end of the year fellowship dinner where the aloha spirit was very much alive. Activities mentioned: the Myanmar and Okinawa conferences and the involvement of more senior members vis a vis chapter activities (Lysia Kee, retiring senior member hopes to spend more time with chapter activities). Chapter leader Nora Chiang reported on two major activities of the Taiwan chapter. Congratulations are in order to the chapter member alumnus artist Robert Cheng-Hsiung Chen. Regarded as the “Godfather of Abstract Art,” he was twice awarded the Florence Biennale’s highest honor, the prestigious Lorenzo il Magnifico Career Achievement in the Arts Award in 1999 and 2001. On July 3, chapter members were involved in the launching of a book that highlighted the art career of Robert Chen for the past sixty years. An earlier Chen book “Sayings of Chen Cheung-Hsiung on Art” not only carried cheerful notes but are described as nourishing to the soul. The book was published in a bilingual volume of 172 pages. Another chapter event involved an outing to Central Taiwan with an overnight stay in Hueisun Experimental Forest, National Chung Hsin University, in late August. The trip included hiking tours, a visit to the Hueisun Coffee Museum. Former Ambassador to the UK, Raymond Tai delighted the 14 chapter members attending about his meetings with foreign leaders like Margaret Thatcher. Thank you Chapter leader Yasukata Yano and the members of your JEWA Tokyo chapter for your support of the Wall of Honor Initiative of the EWC Endowment Committee. The honoring of your member, the late Masao Baba, with your chapter leader donation on October 26, plus the positive contribution of chapter members, led to your chapter donations exceeding the $1,000 mark. Prof. Baba was the first to achieve the status of Wall of Honor awardees. Thank you for your chapter members generosity towards the goal of student scholarships. EWC grantee in the sixties. Chapter leader Jacob Dowd reported on the formation of the Capitol Region, D. C. Chapter’s “Linked-In” group. VP for Chapter Development was invited to re-join membership to the Washington D.C. group of which she accepted (as a returning resident of Honolulu, she is likewise associated with the Hawaii chapter). The Washington D.C. chapter cooperates with the EWC Washington D.C. Office in providing social activities to visiting scholars to the nation’s capitol. Mary Jo Furgal has done an excellent job in this outreach activity. MAHALO EWCA CHAPTERS FOR YOUR MANY ACTIVITIES THAT BENEFIT YOUR COMMUNITIES, OUR EAST WEST CENTER OHANA AND THE GLOBAL SOCIETY THAT SUSTAINS US ALL. ALTRUISM IS THE MARK OF A SUPERIOR CHARACTER. THANK YOU FOR YOUR GENEROUS CONTRIBUTIONS. This entry was posted in Alumni, Uncategorized and tagged EWC Tokyo Chapter, EWCA Brisbane Chapter, EWCA Chapters, EWCA Chennai Chapter, EWCA Hawaii Chapter, EWCA Kansai Chapter, EWCA Karachi Chapter, EWCA Korea Chapter, EWCA Lahore Chapter, EWCA Laos Chapter, EWCA Mumbai Chapter, EWCA Myanmar Chapter, EWCA Nepal Chapter, EWCA New York Chapter, EWCA Northern California Chapter, EWCA Okinawa Chapter, EWCA Papua New Guinea Chapter, EWCA Philippines Chapter, EWCA Singapore Chapter, EWCA Southern California Chapter, EWCA Taiwan Chapter, EWCA Washington D.C. Chapter. Bookmark the permalink.